The Year’s Best Science Fiction and Fantasy Novellas: 2015 inaugurates a new annual series of anthologies featuring some of the year’s best novella-length science fiction and fantasy. Novellas, longer than short stories but shorter than novels, are a rich and rewarding literary form that can fully explore tomorrow’s technology, the far reaches of the future, thought-provoking imaginings, fantastic worlds, and entertaining concepts with the impact of a short story and the detailed breadth of a novel. 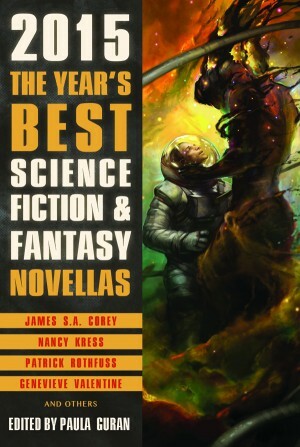 Gathering a wide variety of excellent SF and fantasy, this anthology of “short novels” showcases the talents of both established masters and new writers. Longtime editor Guran (The Year’s Best Dark Fantasy & Horror 2015) makes a thoughtful selection of nine novellas in this high-quality anthology, which skews toward fantastical crime fiction. James S.A. Corey’s “The Churn” reads like a futuristic version of The Wire and is instantly accessible even to readers who aren’t familiar with Corey’s Expanse series. The blend of noir and science fiction is near perfect, with a Baltimore-based gangster, whose decision to eschew his upper-class background and instead work in a criminal enterprise highlights the division between classes, and a pervasive lyric melancholy—one character life is described as “a fabric woven of losses.” Fans of the brilliant sedentary detective Nero Wolfe will be hard-pressed to find a better emulation than John P. Murphy’s “Claudius Rex,” narrated by an Archie Goodwinesque legman who reluctantly partners with the eponymous AI; the story comes complete with Wolfe’s disdain for slang and his desire to reveal his brilliance before a classic gathering of the murder suspects. The other contributions range from epic fantasy to a classic alien invasion with a twist, and all are solid selections. This entry was posted in Editing, News on August 19, 2015 by admin.